Joe Sutliff says, "The Drink and Draw will be Friday, Sept. 6 from 6-8pm at the Pratt Street Alehouse, private room, cash bar and I'm looking at a food menu." So consider attending and either bidding or drawing! Chris Sparks, editor of the book, "Team Cul de Sac: Cartoonists Draw the Line at Parkinsons," heads up an all-star panel of artists! Lincoln Peirce, Mark Tatulli, Lucas Turnbloom, Jenni and Matt Holm, Andrew Farago, Shaenon Garrity, and Rob Harrell talk about their pieces in the book and what the great Richard Thompson's art and writing has meant to them. 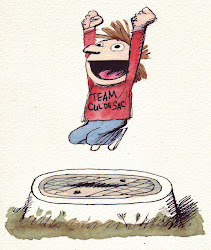 As you know I am leaving on the 17th to go to Comic-Con because Team Cul de Sac is up for an Eisner. Well, to take some pressure off of that award I received some awesome news this morning.Team Cul de Sac was nominated FOUR times for the Harvey Awards! Please consider voting for us if you are a contributor or a professonal in the business. Also,please share and tell all of your pro friends to consider voting for us! I will be at the Harvey Awards and I hope to see many of the contributors there! A big thank you to everyone who is involved in TCDS! Richard Thompson is nominated too! He should win every year but this is the last time the strip will be up for the award! Team Cul de Sac panel and a cool freebie from GoComics! We have some great news for everyone attending the Team Cul de Sac panel on July 20th at Comic-Con. 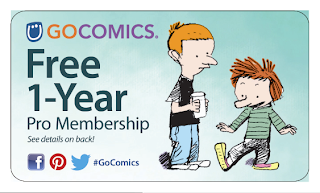 GoComics is giving each attendee a one-year PRO membership to GoComics.com!!! So I am sure to attend now! 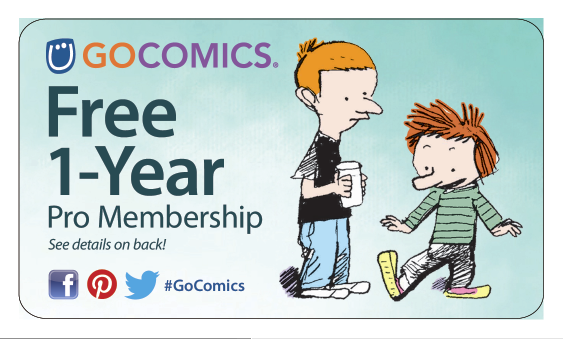 A big thanks to Gocomics!!!! Times and all that cool info is on the last post! Please come and see us take Comic-Con over with this amazing Panel of Cartoonists! Chris Sparks, editor and organizer of the Eisner Award-nominated Team Cul de Sac: Cartoonists Draw the Line at Parkinsons book, is joined by several contributors who will talk about the creation of this original cartoon art book done in tribute to Richard Thompson, Reuben Award winner and the creator of the comic strip Cul de Sac. The book features art from dozens of cartoonists in print and web, including the first original art published in 16 years by Bill Watterson of Calvin and Hobbes fame, and has helped raise over $105,000 towards Parkinsons research through the Michael J. Fox Foundation. Panelists scheduled to appear are Lincoln Peirce (Big Nate), Mark Tatulli (Lio), Lucas Turnbloom (Imagine This), Andrew Farago (curator, Cartoon Art Museum), Shaenon Garrity (Skin Horse, Narbonic), Rob Harrell (Monster on the Hill), Matthew Holm (Baby Mouse), and Jenni Holm(Baby Mouse) an Eisner Award nominee. Moderated by Tom Racine (Tall Tale Radio podcast). Come meet some of the TCDS contributors!